The museum displays exhibits on the maritime heritage of the area, including the Greenport menhaden fishing industry, the oyster industry, lighthouse lenses, a model ship of the USS Ohio, and more. Located in the former Long Island Railroad Station on Third Street, the museum and gift shop is open weekends, May through June and in September; July and August, seven days. 631-477-0439 • RMLI.org. Artifacts and historical information on Long Island’s railroad housed in a restored freight house dating from 1892. Open Memorial Day through Columbus Day weekends. Call for days and times. Located next to the LIRR station at 4th Street. 631-477-2100 • EastEndSeaport.org. The East End Seaport Museum and Marine Foundation runs two hour long Long Beach Bar (Bug) Lighthouse cruises every Saturday at 4:00pm from May through October. The cruises are on the Peconic Star II, and are the best way to see all the lighthouse and the harbor. Call for reservations and information. Greenport waters offer some of the best fishing on Long Island. Starting in April, party boats head out to catch flounder, fluke, striped bass, blues, blackfish and porgies. Capt. Dave Brennan of the Peconic Star Express 631-875-2631 leaves from Railroad Dock in Greenport daily for full day fishing for all species in-season. The Peconic Star II is available for charters. peconicstarboats.com. Capt. Michael Boccio of the Prime Time 3 631-323-2618 • Primetime3.com leaves at 7:00am and 4:00pm daily from Orient by the Sea Marina. Jenglo, the 46-foot Carolina Sportfisherman sails from Orient by the Sea Marina and is available for private charters of 6-15 passengers for inshore and offshore trips, full and half day. 631-323-2618 • jenglo.com. Drossos Miniature Golf is on Route 25 west of Greenport Village. The Course has 18 holes, a village setting with gardens, windmill, waterfalls and buildings. A snack bar and ice cream shop are on premises. Open 10:30am-10:30pm April through November. Living history in a working blacksmith’s shop in a replica of a building that dated from the 1880’s where visitors can see a real blacksmith at work. Located at the edge of Mitchell Park behind the old schoolhouse on Front Street. Open weekends 11:00am-5:00pm, June through September. 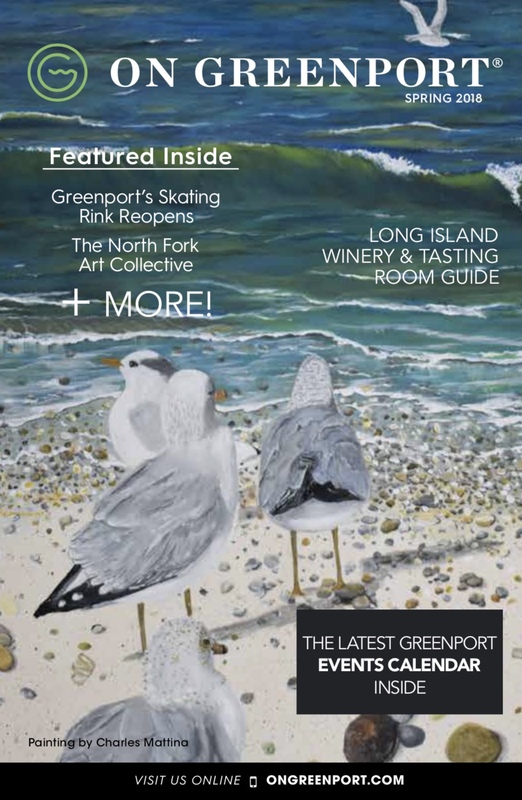 Take a self-guided tour of the Greenport Village Historic District (delineated on map). Free brochures at Triangle Sea Sales, at 36 South Street. Located on the corner of Front and Second Street. Visitors get a glimpse of what schools looked like in past centuries. A great learning experience for kids and adults alike! On Carpenter Street, featuring memorabilia, pictures and historic items from the Greenport Police Department. Tour a working goat farm that produces artisinal cheeses and skin care products. Visit the goats and their babies. Open to the public, guided tours available. Open seven days in season from 10:00am-5:00pm. Call for off season hours. East End Charters knows how to get you out in the water in style, specializing in two-hour, half or full days trips. Offering charters for small and large parties, East End Charters has crewed boats and yachts ranging from a simple harbor tour to a fully customized luxury experience for special events like weddings and corporate parties. Run by native East End sailor Pat Mundus who continues the Mundus family tradition on the water. Crew your own Boat at Port of Egypt Marina at 62300 Main Road – Route 25, Southold. Charter a 18’–27’ Grady-White boat through their seasonal boating club. Club members have access to boats of varying sizes and styles for water skiing, fishing, tubing and cruising. Lessons provided for inexperienced boaters.